Back to Europe and the Netherlands for the second race of the weekend – Ironman Maastricht-Limburg. 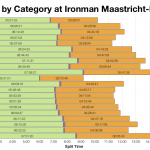 Now that Maastricht is established as part of the European Ironman calendar the number of entrants has doubled and the number of Kona slots has fallen to 40. Tighter odds over its debut year. Results from last year’s race fell inline with those of other European events and it looks like 2016 follows the same pattern. A larger field of competitors tends to give more consistent result sets without much influence from outliers. So the shapes of the 2016 graphs are smoother and better defined. 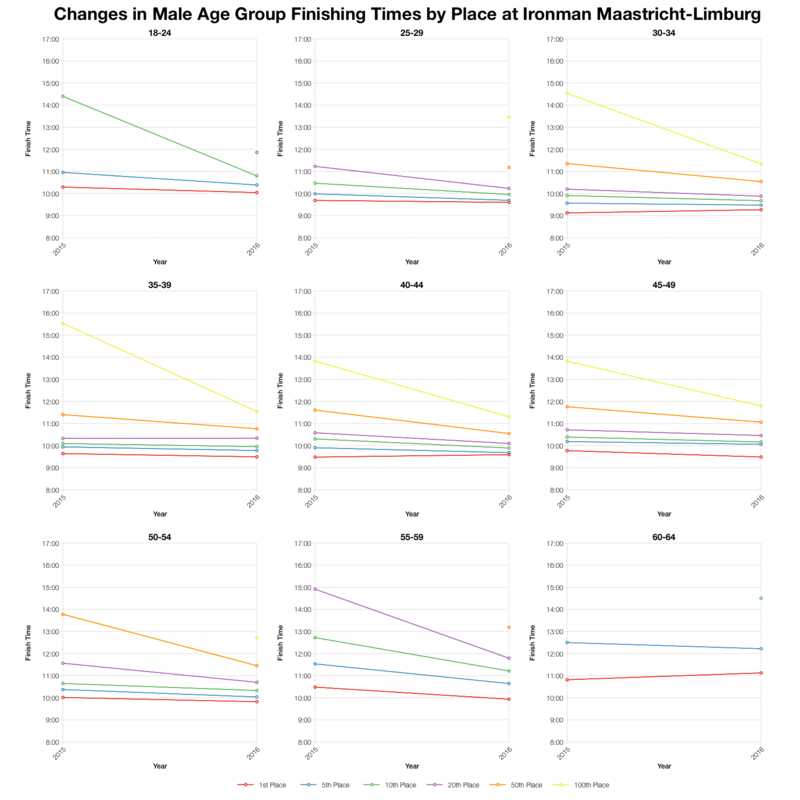 The trends at this year’s race were towards a slower bike and a faster run, resulting in very similar overall splits. 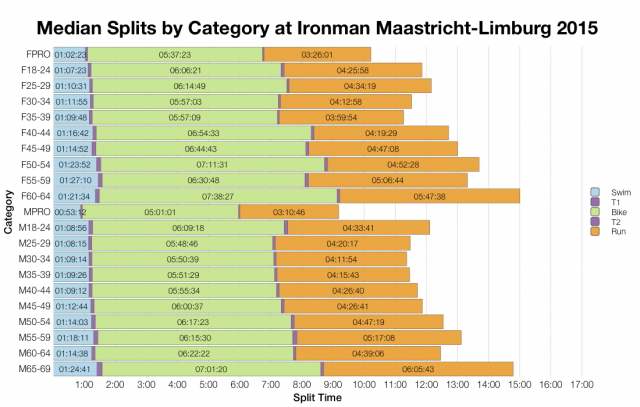 Both shifts are small enough to keep Ironman Maastricht comparable with the majority of European races. Again the larger field means the impact of an individual DNF or DNS is smaller on the percentages. This year’s run was not only faster, but also had fewer DNFs. The net result is a reduction in combined DNF and DNS numbers for this year’s race. 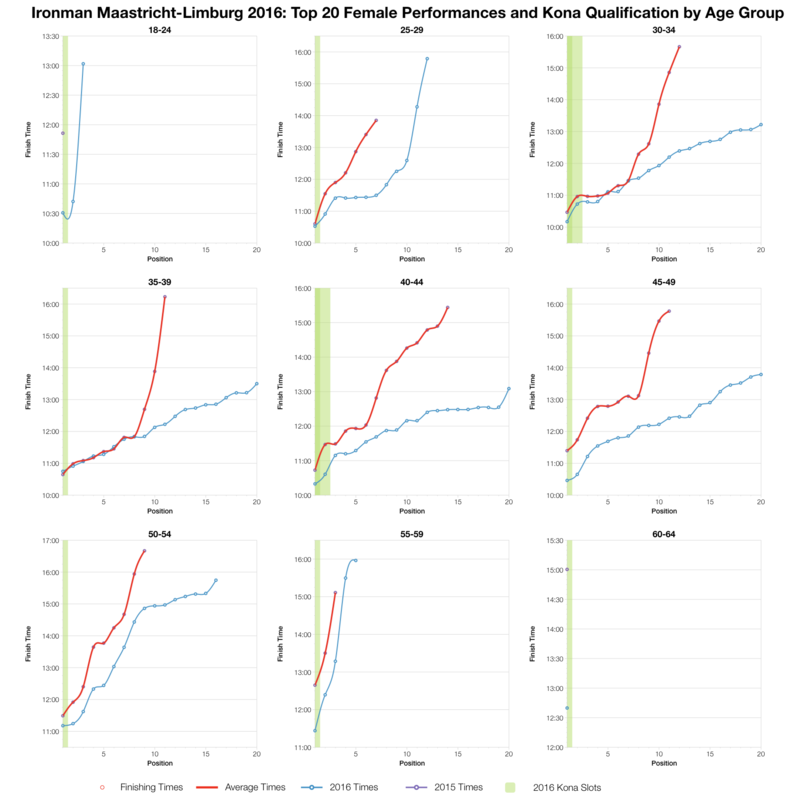 There’s a lot of variation among the age groups when comparing their individual medians. 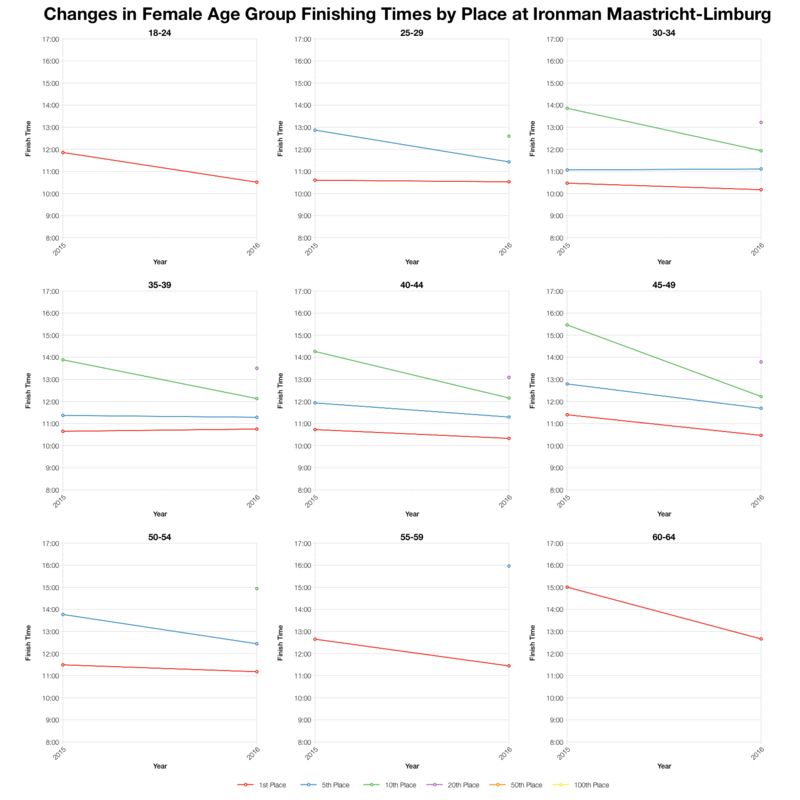 I think some of the female age groups trend slower overall this year, but the male age groups are largely inline with the 2015 results. 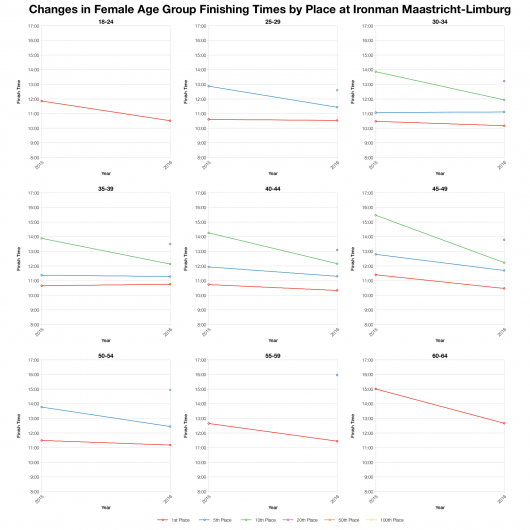 We can also see that the bike is slightly slower and the run slightly faster for most age groups. There’s the usual broad spread of nationalities for a European race with the Netherlands, Belgium and the UK topping the list. Front of pack times have remained consistent between the two years, but as we move back through the field we see improvements. This is largely the result of increasing field size. With many more athletes in each age group 100th place moves from being back-of-pack to middle-of-pack and we see faster times for these lower placings. Based on the athlete tracker I’ve calculated the Kona slot allocation (actual numbers will depend on the official start numbers) and from that the automatic qualification times. 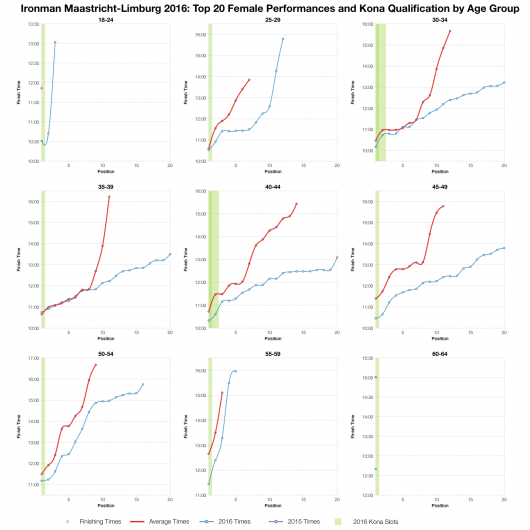 You can compare these figures with those from other races and previous years on my Kona Qualification page. In the case of these top twenty performances our previous average is just the 2015 results. 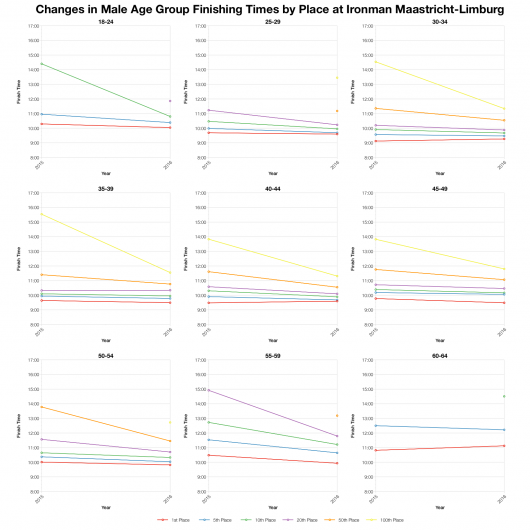 It’s clear here that in the majority of cases the top age groupers were faster at this years race. The biggest differences are further back, beyond tenth place, again the result of the growing field size. 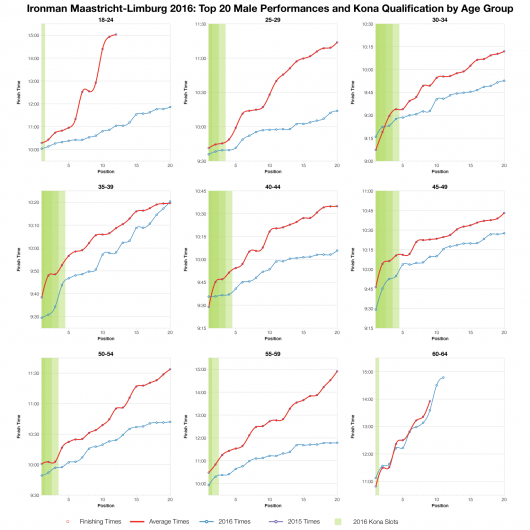 Winning positions are generally faster, but by a lesser degree. 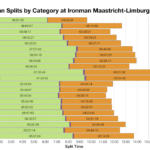 Ironman Maastricht-Limburg is looking to be a typical fast European course. Not quite another Austria or Frankfurt, but still towards the faster end of the calendar. 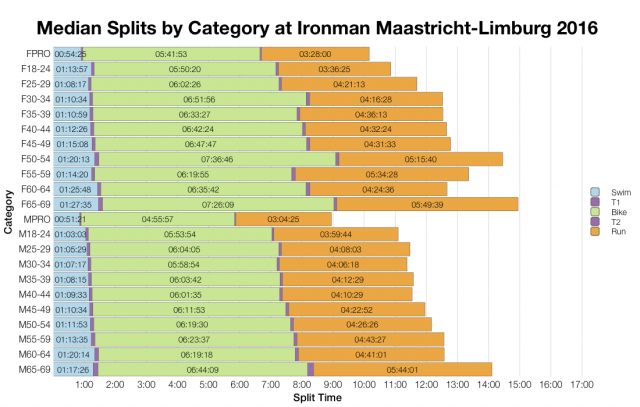 Now there are more competitors and the number of Kona slots is set at 40 that also makes it a typical qualifier. Fast performances are needed in its competitive field. 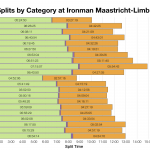 You can access a spreadsheet of the full results and splits from Ironman Maastricht-Limburg 2016 on my Google Drive.